Somewhere in the North Atlantic between Scotland and Iceland lies a group of 18 islands. On a clear day, they sparkle like emeralds tossed onto folds of blue satin, but for most of the time the weather at this latitude is less kind and their appearance is of a rough and unforgiving land shrouded in cloud. These are the Faroe Islands, a place I have wanted to visit for years. Finally, I am here. Surrounded by cold waters, fingers of land with steep slopes and vertiginous cliffs curl round bays and lie along fjords. Clouds rise like theatre curtains to reveal mountains of a deep, but in this light lifeless, green before slowly descending again. It is as if the Nordic gods are teasing the visitor with glimpses of the islands’ beauty. Only when the sun manages to push some rays through the thick grey blanket that covers the heavens does the green take on a vivid, almost glowing, hue as though someone has over adjusted the colours on a photograph. This is the green of the Faroe Islands, a bright green which is mirrored in the wool of this year’s knitted fashions, in the fluorescent lighting above the hotel bar, in the creations of local artists. Here, the primary colours are not red, yellow and blue, but blue, green and grey. On these small islands stubbornly anchored in the North Atlantic, nearly everything in nature is declined in these three tones. So much so that when one sees an occasional crimson or yellow flower peeping out from a bush it catches the eye in a way only a dozen blooms elsewhere would. The islanders seem determined to make up for the limited tones of their natural surroundings by painting their wooden houses and fishing boats in the brightest colours. Not here a palette of sophisticated shades, just the straightforward range from a child’s painting set. Water pours down the precipitous mountainsides, overflowing from some invisible sea hidden by the clouds. It cascades over glistening black rock looking like it has washed away the green veneer. Contemplating the landscape, I feel as if I have suddenly been transported to a medieval world where oceans really do disappear off the ends of the earth. Suddenly, all those tales of the world being flat, of dragons and giants, do not seem so improbable after all. These are landscapes worthy of The Lord of the Rings. Yes, I know it was filmed in New Zealand, but you can imagine trolls and ogres actually living here. How many rocks have I seen that look like crouching hags, tufts of grass on top unkempt hair, or goblins huddling like boulders, waiting to make mischief at any moment? I find myself wondering what it must be like to grow up somewhere so remote, to live in a village where you have to drive through tunnel after tunnel or catch a ferry or helicopter just to go to a town of 20,000 – the capital. I drive through one village – really just a scattering of houses – and see faces peering out from windows, watching the weather, looking at fields of grass. To me, they look like prisoners staring out of cells where the bars are made not of iron, but of kilometres. Yet perhaps they are simply admiring the rugged beauty of nature. 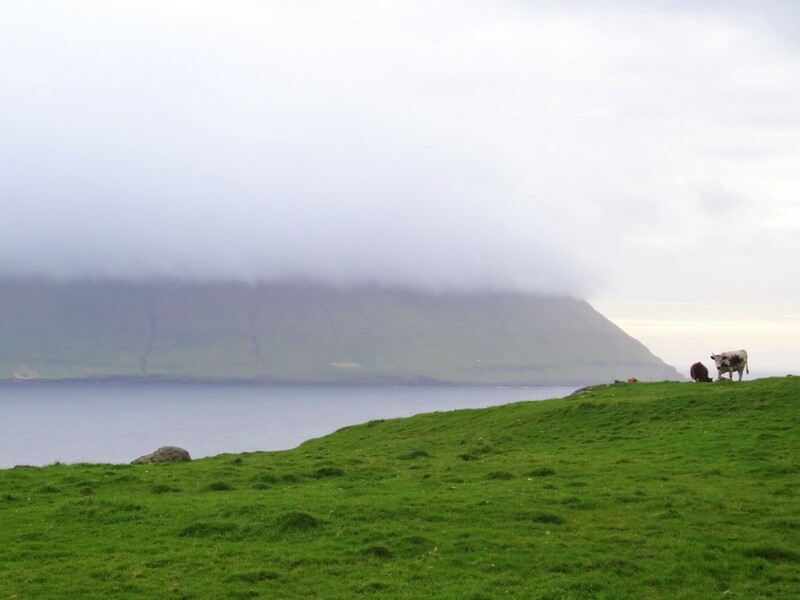 Compared to the lives of their forefathers, today’s Faroese have a comparatively comfortable life. True, fishermen still brave the stormy seas that surround the islands, but they stand a better chance of returning home than previous generations. Across the Faroes, statues of women and children looking longingly out to sea bear witness to tougher times when many who sailed out did not come back. The chromatic ternion of blue, green and grey is mirrored by the three elements that dominate life here: the sea, the land and the weather. I realised this watching the weather forecast. Two minutes described what to expect on land, the rest was dedicated in great detail to the waters around the tiny archipelago. I grew up with the shipping forecast – Lundy, Fastnet, Irish Sea – I can almost recite the zones off by heart, but in the UK the shipping forecast is exactly that – a special broadcast for sea captains, almost mythical beings most landlubbers never meet. Here in the Faroes the reverse is true: the shipping forecast is the main weather report and you are sure half the island is watching intently. The sea is not just something that serves as a scenic background or constitutes a separate world beyond the shore: it is very much part of the universe the Faroese inhabit. Farming is limited by steep slopes and a cool climate, making fishing an important alternative. One thing that does grow here is angelica. I have no idea what the plant looks like. I remember it only as a lurid green candied decoration for cakes from childhood days. Strangely, its colour bears a remarkable similarity to the hue these islands take on when the sun shines. I have decided to create a new expression for my vocabulary – ‘Faroes green’.